The Fair Credit Reporting Act (FCRA) allows for every American to download a copy of their credit report from one of the major credit reporting companies (Equifax, Experian & TransUnion) once a year. This allows you to get a free credit report from one of the three companies, not all three. If you want or need reports from the remaining two, you will have to part with about $8 a pop. After a year, you are eligible for another free credit report. It’s important to note that while the three companies have roughly similar information, they do not necessarily have the same information. You don’t need to get all three, but you should be mindful of this. If something is misreported on one, you really should followup on the other two. If you don’t buy the remaining two reports, I recommend that you cycle through all of the companies every three years. A credit report is not your credit score. 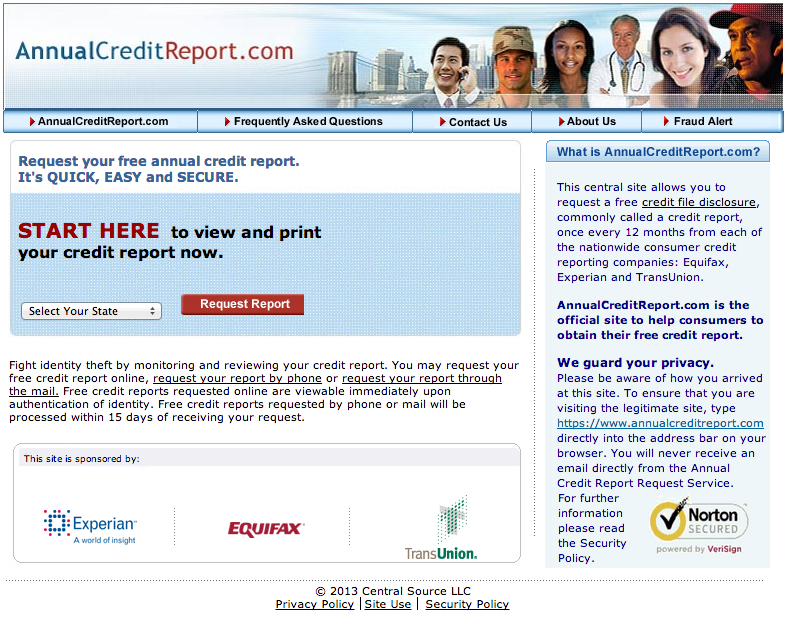 The report shows what is logged against your credit (good or bad). Your credit score is something different, and you guessed it, costs extra. To get this free report, you have to go to AnnualCreditReport.com. Please note that the URL does not have the word “free” in it. If you go to a “free credit report” website, you will find yourself enrolled in some not-so-free subscription services. The rainbow of people in the website’s masthead is to “humanize” the website. Doesn’t it make you feel all humany?